The lifeguard service of the Formentera Council wishes to announce that Sunday, September 16 at 6.30pm, staff will meet on Es Pujols beach for the team's second ever torxada. The evening of cameraderie will see the lifeguards putting their swimming, towing and racing skills to the test, along with other good, clean fun. 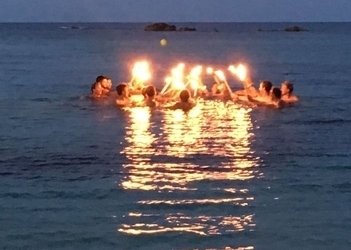 At sundown, they'll take to the water, equipped with flaming torxes (“torches”). Team chief Marco Antonio Lage says it's about “coming together as a team as we prepare to say our first goodbyes to those leaving already”. The whole island, says Lage, is encouraged “to check out the spectacle, and get to know our service a little better”. High season for Formentera's beach rescue service extends from June 15 to September 15. During that period, the service employs 23 lifeguards to hold watch over the island's waters and ensure swimmer safety. Beaches are patrolled May 1 to October 31. September 15-30, there are 15 lifeguards to surveil Formentera's coastline; September 30-October 31, a group of 10 remain at the season's close, as at its start.